These three elements come together via our customised training solutions to bring the best out of every individual, whether they are first time managers, managers of managers, or business leaders. At GBS, we believe every manager in every organisation has the potential to achieve so much more. Change is one of few constants in the modern workplace. 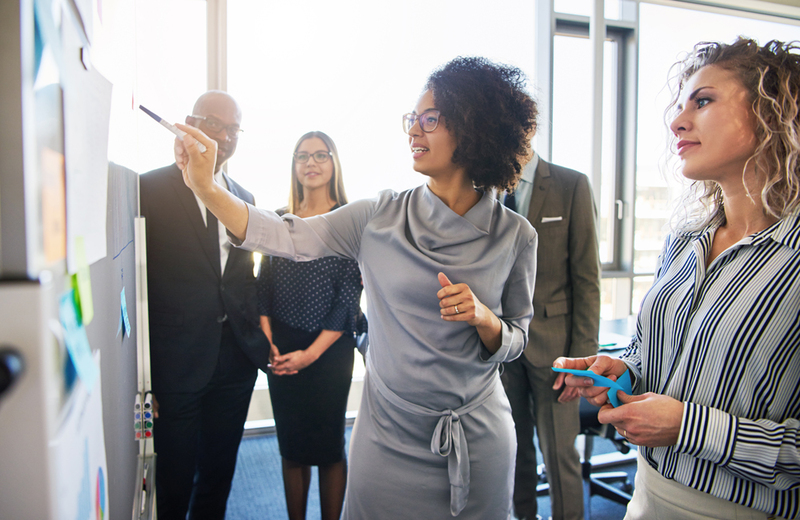 And, as many executives struggle to engage with staff in a changing world, increasingly organisations are turning to management and leadership development programmes to help them reconnect. So, what kind of leadership development programme or curriculum is right for your organisation? The answer, of course, is a learning event or series that is as unique as your organisation, one that reflects your organisation’s key leadership and management competencies and meets your short to long term business objectives. GBS is a leading provider of bespoke learning solutions. We work with our clients to co-develop customised and blended learning programmes. Each is unique to the organisation that we work with, developed to match their specific requirements. High performing teams, good project management, strong line management skills, productivity, staff retention and culture are not all shaped by leaders, but by managers too. Unfortunately, many people promoted into line management lack vital people management skills and are promoted into incompetence. So, whilst leaders bring vision, inspiration and a wide range of strategic skills to an organisation, the importance of good management cannot be underestimated. Good management requires unique skills that don’t always come naturally and if there has not been a great senior manager to provide a management role model, line managers can be left floundering. Great leadership skills are crucial to the commercial future of your business. All organisations are different. Just as there is no one-size-fits-all leadership style, there is no one-size-fits-all leadership training curriculum. Our leadership development approach uses the fundamentals of the Situational Leadership® model to build the skills of your current and future leaders. We combine our strategic expertise with hands-on, customised elements to create a sustainable structure for success. Look out for our blog next week in which we provide more details about Situational Leadership® Building Leaders training. Our customised leadership development programmes are designed to help people think, believe and act as leaders, embedding the fundamental shift from thinking and acting like a manager, to being respected as an authentic and inspirational leader. GBS offers a wide range of people management training courses, from bite-size modules to fully customised learning programmes which can be certified by the Institute of Leadership and Management (ILM) or Chartered Management Institute (CMI) and result in a nationally recognised qualification in Management and Leadership. We work with you to understand your organisation, and once we fully understand your needs we design and deliver powerful interventions that ensure all participants are stretched, challenged, and motivated to try new ways of working. We do not promote or believe in any ‘single-answer-solution’ to the challenges facing today’s highly complex and competitive commercial and cultural environments. We believe that no two organisations are the same, and, that the same apparent problem in two different organisations cannot be solved with the same solution! GBS will develop a tailor-made learning solution that is a perfect fit for your organisation. We have designed and delivered programmes for many multi-national clients, helping them to build learning solutions including performance management, people management and dealing with change. We have a proven track record in helping businesses create the change needed to remain competitive in the challenging business landscape of 2018/19. Our customised training solutions, designed uniquely for your business, are created to engage people intellectually and emotionally, helping to shape underlying attitudes and encouraging them to think, feel and act differently. We research, design, and apply, finely tuned development interventions around the 70:20:10 principles to help meet the challenges of today, and, equip your people for an increasingly challenging tomorrow. No matter what the situation may be, we work closely with our client organisations to ensure that we provide their leaders and managers with challenging growth opportunities that will build their confidence and bring their contribution to the organisation up to the next level. We deliver solutions both nationally and internationally for our clients, often working with multi-cultural groups. We have built our reputation and success on an ability to align development to specific commercial, individual and group needs. Because we have an immense library of existing material and resources, as well as the ability to produce highly customised material for our clients, we are able to efficiently design and develop value-added, cost-effective programmes that focus on the current issues leaders and managers face today. We are also exceptionally flexible and willing to work with our clients’ existing content, integrate our work with programmes the organisation already has in place, or collaborate with the organisation’s other training providers if appropriate. We ensure that the management and leadership development solution we create is tailored to your own company needs. We strive to help every business we work with, regardless of size, be successful by utilising our unique approach to management and leadership development training. Commitment to the continuous learning and development of employees is essential in order to stay competitive in any industry. Knowledgeable, properly-trained employees can be a source of profit for an organisation, while employees who have had limited training are less likely to be efficient, motivated and adept workers. Training can also be used as a recruitment and retention tool; organisations that offer development opportunities are more likely to attract and retain valuable employees. Having a course built specifically for your teams is often quite reasonable if you consider the cost savings of having the training conducted onsite and having it focused on specific content that is relevant to your team. Instead of having a staff member at a full day session where only a few hours are relevant, having a half or full day session pertinent to the needs of all team members is a useful investment of time. That said we offer a range of shorter, bite-sized training events which can be combined to provide a full day of training. Like many other business decisions, choosing training for yourself or staff members should be strategic. The investment should be made considering what the desired measurable outcome is compared to available options to accomplish that outcome. GBS has been providing learning solutions to businesses for over 60 years and clients come back to us again and again to help them develop their Staff, Managers and Leaders to fulfil their potential and drive forward their businesses. Look out for our blog next week about Situational Leadership® Building Leaders training.